Holdups are not uncommon on the M25, Britain's busiest (and sometimes slowest) motorway. But it's not often that a section of the road is closed off for the sake of a bird! 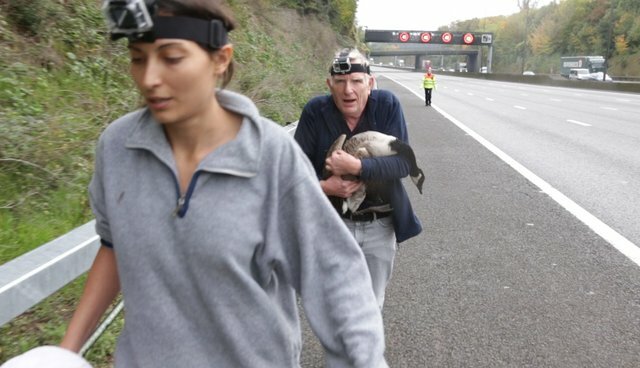 This was what happened when Leatherhead-based animal charity the Wildlife Aid Foundation were called in to rescue an unfortunate Canada Goose that had crash-landed on the motorway near Junction 9. WAF were contacted by the Highways Agency to alert them to the incident, and volunteer vet Cristina Flamini and rescuer Ron Turner were immediately dispatched to the scene. When the WAF team got there, the injured bird – it had broken its wing and was unable to fly – was wandering around in a daze along the hard shoulder. Luckily, it was behind the crash barrier. On WAF's advice the Highways Agency put a rolling roadblock in place, as Cristina and Ron were very concerned that the bird might run into the oncoming traffic. Fortunately the Canada goose saw sense and tried to climb up the bank, where he was tackled and captured by a fearless Cristina! A very dramatic rescue, and it was a miracle that nobody was hurt, either bird or human! The Canada goose is being treated for its wounds at the WAF veterinary hospital in Leatherhead and hopefully it will be possible to release the bird back into the wild in due course. WAF's rescuers have to tackle tricky situations like this every day. In all, the charity deals with some 20,000 wildlife incidents every year. Please help the Wildlife Aid Foundation to continue its vital work by making a donation online here.